This virtual field trip takes students to Belize, Central America where they can experience the sights and sounds of the rainforest without leaving the classroom. 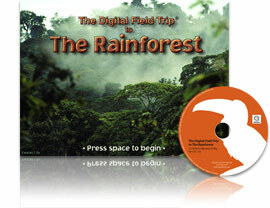 Photos, videos, animations and interactive exercises help students learn about a wide range of topics including, but not limited to: rainforest types, rainforest plants and animals, how they depend on each other for survival, climate, soils and decomposition, botany and how humans affect this important ecosystem. The interactive map, context-sensitive help and definitions on almost every word ensure you never get lost. Integrated text-to-speech provides support for visually-challenged and auditory learners. This program can prepare students for a real field trip to the rainforest or, when that is not possible, provide the next best experience. Use it in the classroom, computer lab or for independent study. It?s a truly interactive and fun way to learn! Electronic versions of the workbook materials are included on the disc in printable format. Printed workbook materials are available by special order (in North America only) email marketing@digitalfrog.com or call 1-800-FROG(3764) for information. While not all topics/activities are suitable for younger children, the program engages and supports learning for Grades K-12. Windows: Pentium II with Windows 7, XP or Vista (Pentium III recommended). 32 MB of RAM (64 or more recommended) 75 MB of hard drive space for QuickTime. Macintosh: Mac OSX 10.6 or later, 30 MB of available RAM. Lifetime (no expiry date) or annual subscription (expires after one year). Any number of seats (if you don't see the required number of seats in the drop down list, email us. An encoded license number allowing access to all programs with no expiry date. What is a seat? A seat is one computer user as determined by the home folder or directory of the current user. You will need to buy a “seat” for each computer that will run the software. How do I get it? Programs are downloaded. Ensure that your email address is correct as unlock codes will be sent via email. Your unlock license code may take up to 2 business days to arrive; it is generated by "real people". Please make sure emails from "digitalfrog.com" are not blocked. Expired license code? Note this in the comments and we will modify the parameters so you can continue using the same code. All educational licensing includes public performance rights - ideal for use with an interactive whiteboard. Lifetime licensing is valid in perpetuity: the number of computers depends on the number of seats purchased. Prices start at $99.00. Click on the image to select the number of seats. Educational licensing includes public performance rights - ideal with an interactive whiteboard. The number of computers depends on the number of seats purchased. Prices start at $104.00 per year for five computers. Click on the image to select the number of seats. The Home License includes the same content as the educational versions but, just like the DVDs you rent, is licensed for home use only. It includes workbook materials (teacher/student) in electronic formats but not public performance rights. It is licensed for THREE computers in your home. Ideal for homeschoolers.